The Top Kill attempts have failed, and the Government has a response. But while waiting for that, and for the Lower Marine Riser Package (LMRP) I thought I would spend a few paragraphs discussing why Top Kill may have failed. In a couple of earlier posts I wrote about how it was necessary to fill the gaps that ran through the Blow-Out Preventer (BOP) either with spheres and triangles or with wire(string would act similarly). To refresh your memory, in the initial simpler analysis I had put up a simple sketch of the BOP and well, to show how the blocking particles were injected. Now unfortunately that diagram missed a significant part out, and that is that there are three sets of pipes leading down into the well. These are the well outer casing, which, surrounded by a layer of cement, holds the BOP in place. Then there is the production casing, which had just been set to the full depth of the well. And there is the drill pipe that, at the time of the incident, extended down 8,367 ft from the platform, or roughly 3,367 ft below the BOP. That drill pipe (DP) had previously been used to locate the production casing at the bottom of the well, and itself now rode inside that production casing. In most normal operations it is closed at the bottom by a drill bit, but (and I’ll come back to this later) it had just finished the cementing of the production casing into position, and once it detached from that and was being pulled from the well, it was an open pipe all the way up to the rig floor. And in that condition it could be used for other things. By pulling mud out of the DP and transferring it to the mud pits (or standoff vessel), the level in the riser would fall and be replaced by seawater flowing in at the top. Unfortunately this also lowered the weight of mud in the well, and that is what caused the oil and gas to flow into the well. Outside of the DP is the casing and cement segments that make up the outer lining of the well. 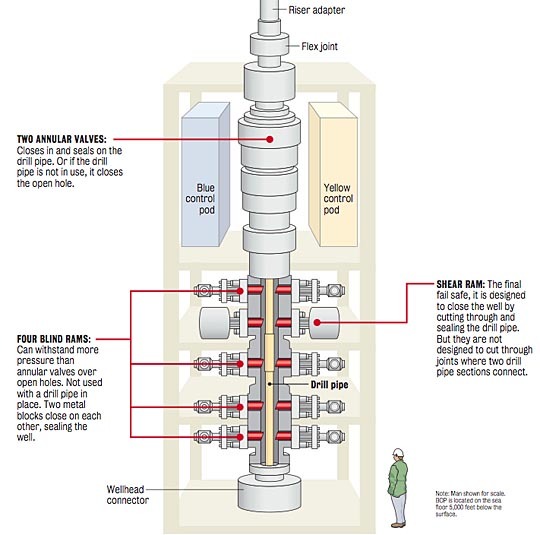 The diagram presented in Congressional testimony, shows these various pipes, except for the central drill pipe. BP do not know, but believe that the oil is getting into the well through the cement wall at the bottom of the well, and probably rising up the well through the empty space (annulus) between the production casing and the outer lining of the well. 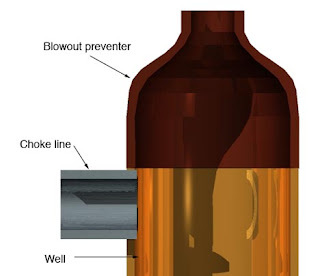 However the oil and gas may have broken through the bottom of the cement plug and be rising up within the production casing, in which it is also rising through the BP once the oil reaches its lower end. Most normal blowouts occur when the well is being drilled, and mud is flowing down, through the drill bit, and then back up the space (the annulus) between the DP and the rock wall. Thus, when there is a blowout, the oil and gas that flow into the well normally flow up this outer passage to the rig, and give the spectacular fountain of oil. The BOP was invented (by Harry Cameron and Jim Abercrombie) to stop that flow and to protect the crew at the surface. 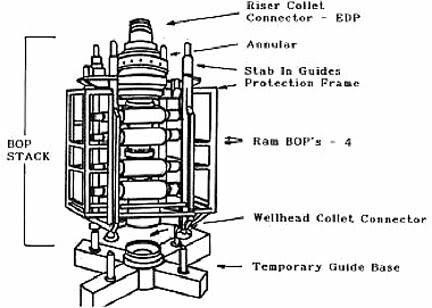 Because the flow is normally up the outside of the drill pipe, the initial BOP designs were rams that pushed seals across the flow path through the BOP, and sealed against the side of the DP. 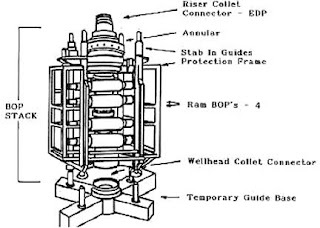 A BOP could have two of these mounted so that one sealed to the production casing in the well, and one to the drill pipe, but if underwater then the production casing is tied back to the Wellhead Collet Connector, and then the only tube running through the BOP will be the DP, to which they will seal. The problem that this leaves, in the current situation is that the pipe that runs through these two seals is open at the bottom to the oil flow. So how can the flow through this be stopped? The answer is to mount a top ram set that has a set of shear cutting blades on it, that will cut through the pipe and seal the full face of the well. The BP should shear, but would be held in place by the grip of the annular sealing rams below. In this case it seems to be recognized that for some reason this shear event did not totally succeed. Thus the pipe was not totally severed and the two shear plates did not fully move over one another to complete the seal. Now this is where the problem arises, because, in part, that pipe is still open at its lower end. If the leak is around the outside of the pipe, through a gap that has generated between the pipe and the annular seals, then the use of the junk shot to fill the cracks and gaps could conventionally have worked. But the configuration of the rams on the Deepwater Horizon had changed from the initial simpler configuration to add seals for occasions where the drill pipe was not in place. And the "junk" is being injected at the bottom of this stack. If the leak is coming up through the remnants of the drill pipe then life is complicated. It can’t all be coming up through an undamaged pipe alone, since it was the far open end of that which was successfully closed at the beginning of the remedial steps, but if it is coming through the pipe and leaking out at the shear rams into the annulus that feeds into the riser, and out to the sea, then putting sealing particles into the bottom of the BOP to seal the cracks, could have sealed some of the leakage around the DP trapped in the shears, but not that flowing through the shears in the remaining pipe section. The reason that it can’t is that the access to that flow is occurring 3,367 ft below the riser, and there is no easy way to get the sealing particles down that far. If they are mixed with mud and pushed down the well to that level and then released they have a different problem. The hope when they were released into the well was that the flow of the current would be enough to carry them up to the cracks that they could seal. But if they have to be carried down to the zone where the oil remains, then their density may be sufficient, if they get into the flow without enough speed to lift them up into the BOP to cause them to sink to the bottom of the well. Those materials, including fibrous pieces of rope and chunks of rubber, were supposed to force more of the mud down the wellbore, but ultimately it did not work. Rubber has a specific gravity of 0.91 and rope varies from 0.9 to 1.4. But remember that at that depth any buoyancy from air entrainment would be lost. In other circumstances it might have worked, If they could have dropped the DP out of the shears perhaps, but they couldn’t and it didn’t. So on to the LMRP. UPDATE: Thinking about this a little more, I had two more thoughts. The first is that once the LMRP preparation cuts off the riser and the bent drill pipe that the full weight of the pipe below the shears may come onto the section in the shear jaws at the moment, pulling them further out of alignment and increasing the flows. It could also cause the pipe to drop out of the jaws, pulled out by the underlying weight, and hopefully not distorting them too much so that in the best of worlds they could then be cranked shut. One could also, once the bent riser and pipe had been cut, go in down the pipe bit that extends up, go down past the annular seals with an abrasive jet lance (most of the flow is around the DP as we have established above) and cut it off, right above the shears. Then partially open the shears, drop the pipe out, and close them again. If they move all the way closed, without the obstruction, then the well may be sealed. (Note because a) this is really a sort of Tech Talk, and b) its a nice day, there won't be the regular Sunday tech talk which would have been on coal mining today - it is postponed, as was the Saturday discussion of state climate changes - hopefully I'll be able to get back to both of those before long). HO -- that is a thought-provoking suggestion. You are certainly correct that the drill pipe stuck in the BOP could be providing a conduit. The difficulty is trying to make the numbers work. I can't draw a pressure versus depth plot that seems to make sense -- for any scenario! BP have said that one of the things they learned from the failed top kill is that there are obstructions to flow in the well, and those obstructions are below the BOP. There have been other reported comments from BP (reported by the media, so very large grains of salt are in order) that the pressure below the BOP is lower than expected. 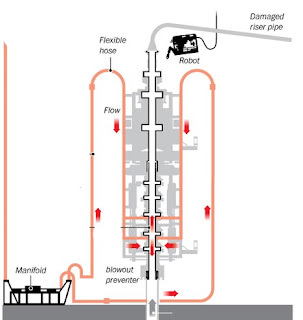 If fluid were able to flow through the BOP stack via the drill pipe and then was getting constricted by the bent & broken pipe, that would suggest the main pressure drop would be above the BOP, not below it. 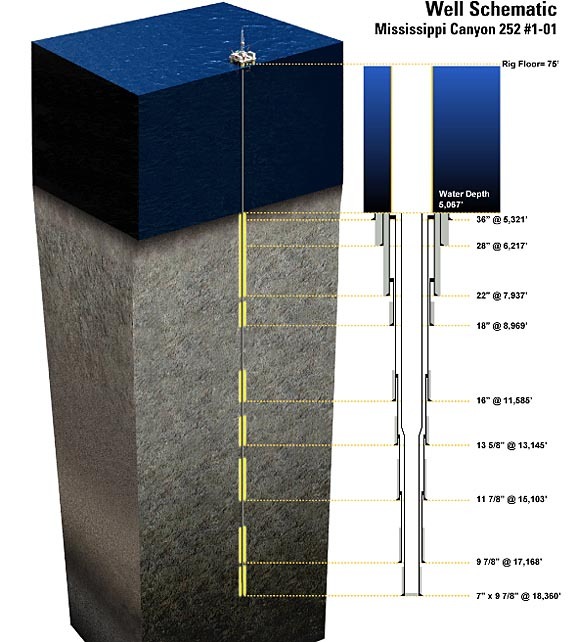 To try to put some kind of bounds on this -- if the reservoir pressure is around 13,000 psi (again, reported - but also typical for GoM at that depth) and if the density of a flowing oil/gas column is about 0.3 psi/foot (again, typical value), the pressure below the BOP on the sea floor would be expected to be around 9,000 psi. Instead, the pressure seems to be around 2,600 psi - tieing into the BP statement about the pressure below the BOP being less than expected. The lower than expected pressure below the BOP would suggest very substantial pressure drops (due to constrictions) somewhere in the flow path from the reservoir to the BOP. BP pumped 30,000 barrels of mud -- about 10 times the volume of the well. 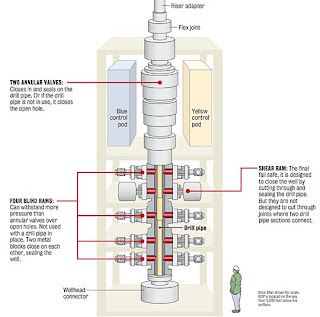 They pumped at rates up to 80 barrels/min -- that's 115,000 barrels per day! The junk shots should have ensured that a higher proportion of the injected mud went down the well than leaked out. But even with unsuccessful junk shots, the mud injection volumes and rates were so high that it seems the top kill should have put enough mud into the well to kill it, even with a lot of leakage. Bottom line, the top kill did not work because they were not able to create a continuous mud column all the way from the choke & kill lines on the BOP down to the reservoir. Why not? Your suggestion, HO, that the mud leaked out through the drill pipe might be the explanation. Another possible explanation -- the same constrictions in the well that are causing the lower than expected pressure below the BOP could have prevented pumping enough mud through the constrictions to get a continuous mud column down to the reservoir. 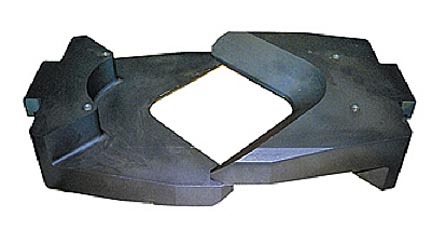 A crimp in a pipe constricts flow in either direction. A likely constriction would be the liner hanger close to the top of the well between the 9 7/8 production casing and the 16 inch casing. Maybe they were not able to pump much mud into that 9 7/8 by 16 inch annulus at all? Yet another possibility is that BP was indeed successful in pumping mud down whatever annulus is flowing -- but at pressures above the fracture gradient. The mud then was unintentionally pumped into the rock at some intermediate depth below the base of the 16 inch casing shoe (approx 6,200 feet below the sea floor) -- basically, a giant lost circulation event. When BP stopped pumping, the hydrocarbons from the reservoir simply displaced the remaining partial mud column out the wellbore and carried on blowing out. We only have drips & drabs of data here, which is frustrating. But I can see why BP might conclude that the only way to kill this well is from the bottom up (with a relief well), not from the top down. Thanks - the pressure at the bottom of the well is around 13,000 psi, or so I have heard, while the pressure just below the BOP was measured at 8,000 to 9,000 psi. On the other side of the BOP it is about 500 psi above local ambient (sea pressure) implying that the riser bend doesn't contribute much - I am going to write about this a little later in the week. But we have to tease this sort of data out of that we are given. ok, now that I have a better grasp of what is inside the BOP at the moment, the thought occurs to me that if the riser were sawed off/removed, and the rams opened on the BOP the pipe could do one of two (ok maybe three) things. If the piston effect combined with the friction of the flow through and around the pipe is high enough to overcome the weight of the DP, the pipe might just pop right out not unlike the way gushers used to before Cameron and Abercrombie came along. If the weight of the pipe is high enough to overcome that piston effect, it will fall back into the well. But the question is are there any obstructions (pieces of the plugs) in the way to keep it from dropping out of the BOP.